had these deficiencies. 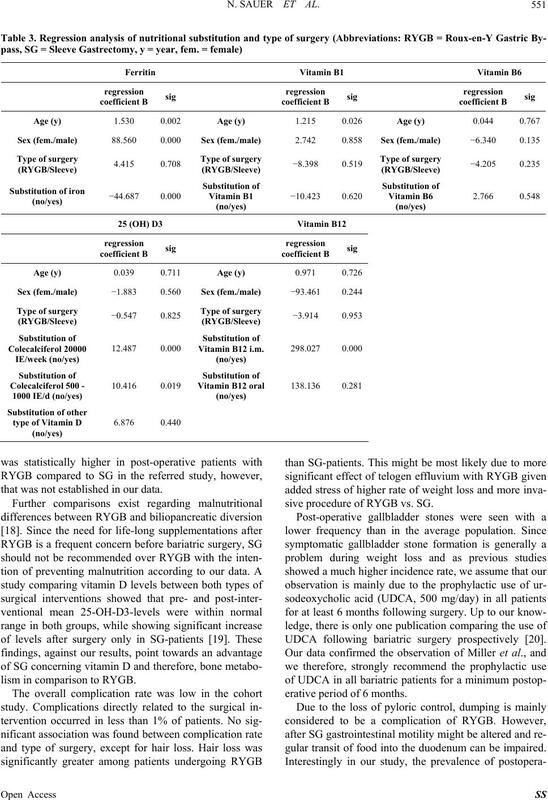 There was no significant difference in average vitamin and iron levels between RYGB and SG. 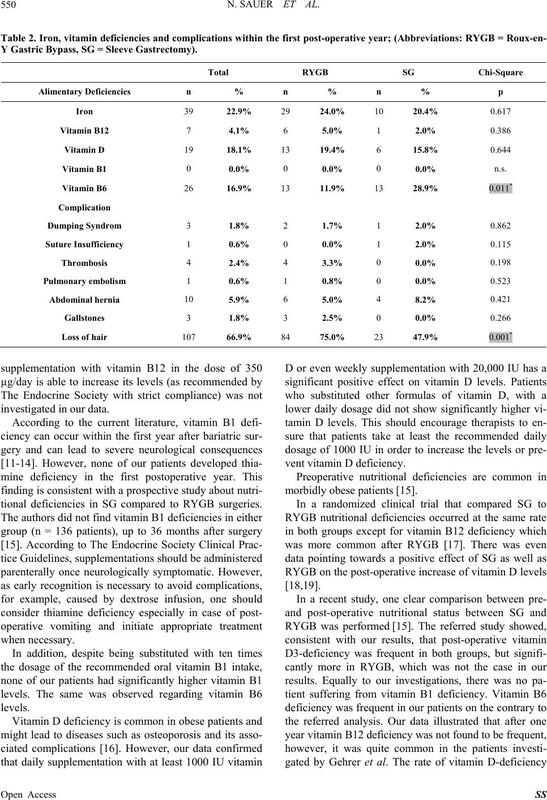 Vitamin D at least 1000 IU per day and vitamin B12 i.m. administration in case of a deficiency. surgical complication rates in our patients. between September 2010 and September 2011 (n = 330). into RYBG) were excluded (n = 6). tive, followed by yearly visits for life-time. 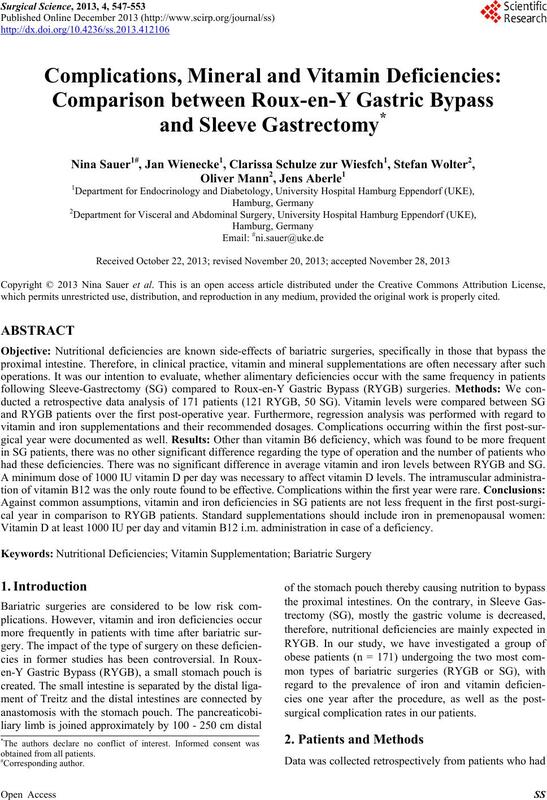 ciency = vitamin B6 < 7.5 µg/l. mg p.o. per day and 180 mg iron-sulphate-complex p.o. the recommendations of a biostatistician. ear regression models of SPSS (Figure 1). “BMI at year 1” are listed as “mean ± standard deviation”. pared to those with RYGB (male: 11.6%, female 88.4%). two groups was not reached (graph 1). surgery had no influence on any of the deficiencies. was even higher if replaced with 20,000 IU per week. lower ferritin levels in young pre-menopausal women. 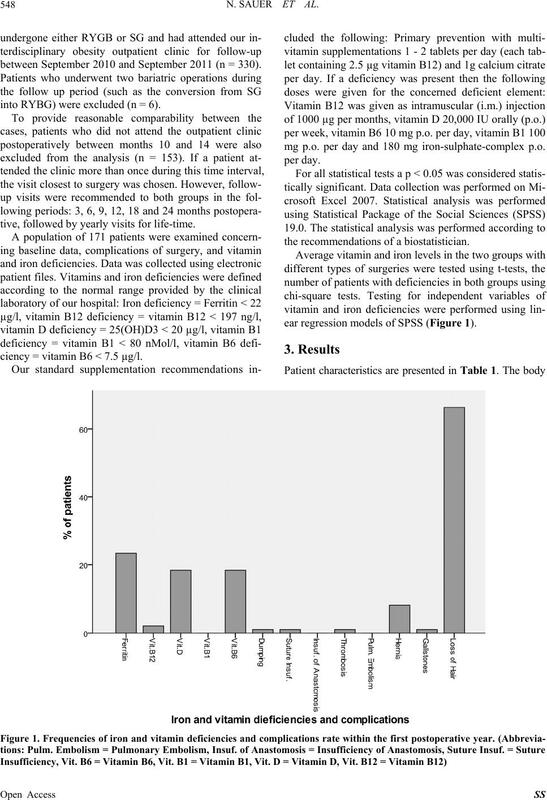 tient compliance with additional oral vitamin B12 doses. Y Gastric Bypass, SG = Sleeve Gastrectomy). Vitamin B1 0 0.0% 0 0.0% 0 0.0% n.s. 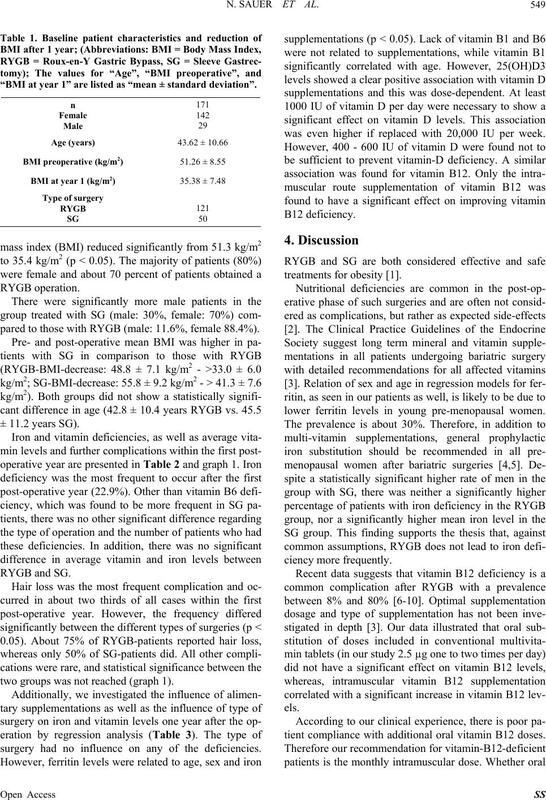 tional deficiencies in SG compared to RYGB surgeries. that was not established in our data. lism in comparison to RYGB. sive procedure of RYGB vs. SG. UDCA following bariatric surgery prospectively . erative period of 6 months. gular transit of food into the duodenum can be impaired. tive dumping was not different between RYGB and SG. for one year following the bariatric surgery. fective in preventing vitamin deficiencies. Design, Vol. 17, No. 12, 2011, pp. 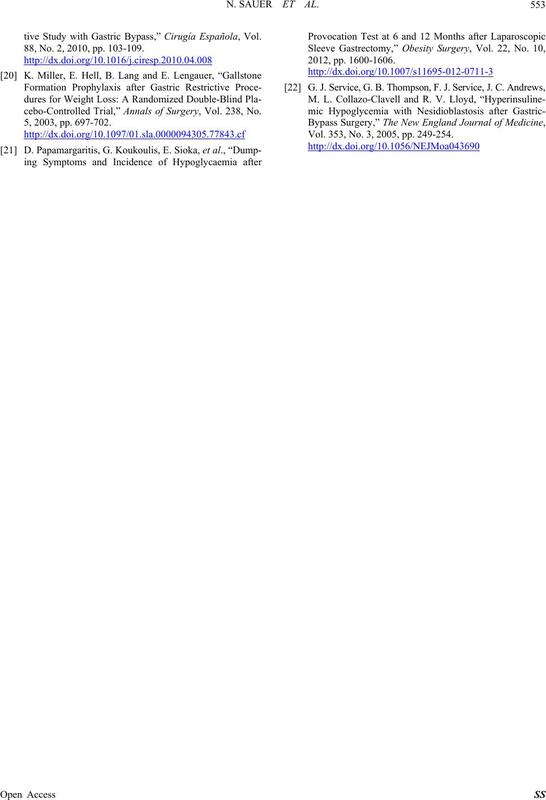 1209-1217.
nal of Endocrinology, Vol. 165, No. 2, 2011, pp. 171-176.
pass,” Obesity Surgery, Vol. 9, No. 1, 1999, pp. 17-21.
tric Bypass for Morbid Obesity,” Annals of Surgery, Vol. 218, No. 1, 1993, pp. 91-96. Dig est ive Disea ses a nd Sciences, Vol. 34, No. 8, 1989, pp. P. L. Cooper, L. K. Brearley, A. C. Jamieson and M. J.
Obesity Surgery: A Systematic Review,” Neurology, Vol. 68, No. 11, 2007, pp. 807-811.
koff Syndrome in a Bariatric Unit,” Obesity Surgery, Vol. 12, No. 3, 2002, pp. 328-334.
dy,” Obesity Surgery, Vol. 20, No. 4, 2010, pp. 447-453. Obesity Surgery, Vol. 18, No. 2, 2008, pp. 220-224. 50 kg/m2,” Obesity Surgery, Vol. 21, No. 11, 2011, pp. Vol. 9, No. 2, 1999, pp. 150-154.
tive Study with Gastric Bypass,” Cirugía Española, Vol. 88, No. 2, 2010, pp. 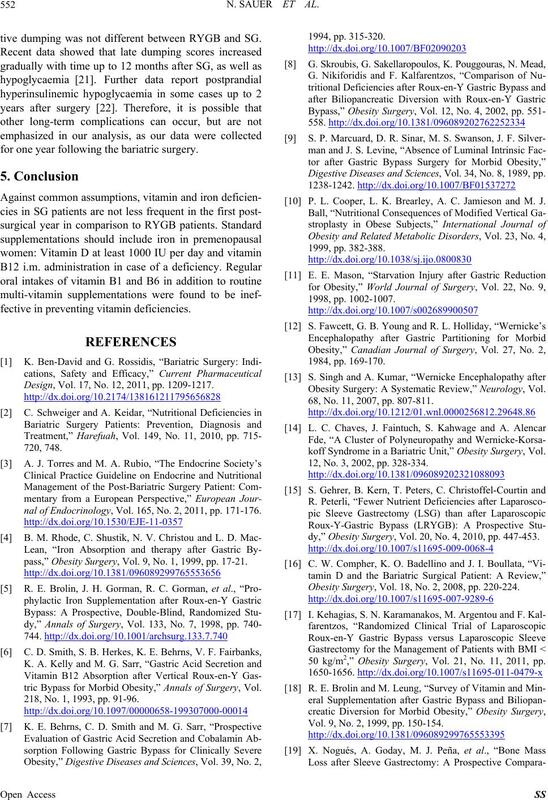 103-109.
cebo-Controlled Trial,” Annals of Surgery, Vol. 238, No. Vol. 353, No. 3, 2005, pp. 249-254.